Students Sara Ma and Dorothy Chen from Troy, Mich., are winners of the YouTube Space Lab competition to design science experiments to fly in space. 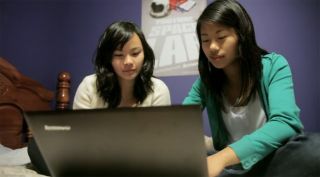 Their project on bacteria growth in microgravity will launch on a Japanese rocket July 20, 2012. Alien superbugs and space spiders are the subjects of two student-designed science experiments due to launch toward the International Space Station today (July 20) aboard a robotic Japanese spacecraft. The projects were chosen by the public as part of the YouTube Space Lab competition, which allowed students between the ages of 14 to 18 to submit videos describing their scientific visions. Two of the winners — Dorothy Chen and Sara Ma, both 16, of Troy, Mich. — will be on hand at the Tanegashima Space Center in southern Japan for the liftoff of their experiment at 10:06 p.m. EDT tonight, July 20 (0206 GMT Saturday, or 11:06 a.m. Japan time Saturday). The experiments will fly aboard the Japanese Aerospace Exploration Agency's unmanned H-2 Transfer Vehicle-3 (HTV-3), nicknamed Kounotori 3 (Japanese for "White Stork 3"). The vehicle will deliver food, supplies and new scientific equipment to the six astronauts living and working on the orbiting laboratory. Chen and Ma's experiment, entitled "Could alien superbugs cure disease on Earth? ", follows on work showing that bacteria grown in weightlessness can be more infectious than Earth-bound varieties. The new project will send a strain of bacteria called Bacillus Subtilis into space to see if introducing different nutrients or compounds in the microgravity environment could block its growth. The ultimate goal of the research is to learn whether insights from space bacteria could help cure diseases in humans. "I'm excited just thinking about it, a part of us — something that Dorothy and I created from scratch — will be orbiting us high above the atmosphere," Chen said in a statement. "Watching our experiment launch into space to be conducted on the International Space Station will definitely be a surreal moment." The other winning project, submitted by Amr Mohamed, 18, of Alexandria, Egypt, is entitled "Can you teach an old spider new tricks?" Mohamed's experiment will send zebra spiders into space to see if weightlessness will interfere with the animals' ability to jump on its prey. He hopes to learn more about these spiders' hunting methods by testing whether microgravity will foil their traditional hunting methods or whether the spiders will adapt. Amr Mohamed, 18, of Alexandria, Egypt, winner of the YouTube Space Lab competition for student science projects, attends Space Camp at Star City, Russia in summer 2012. "The idea of sending an experiment to space is the most exciting thing that I have ever heard in my life," Mohamed said in a YouTube video about the competition. "It feels great to represent all the Middle East, because Egypt's contribution to the field of space exploration has been minimal, so winning YouTube Space Lab will mean everything to me, to my family, and to people in the Middle East." Once the projects are delivered to the space station, NASA astronaut Sunita Williams will perform the experiments according to the directions provided by the students. The results of the trials will be streamed live on YouTube this fall. The winners of the competition were judged by more than 150,000 YouTube users worldwide voting on their favorite entrants. The champions were awarded Lenovo laptops, as well as a choice between the chance to watch their experiment fly aboard Kounotori 3 from Japan, or the opportunity to attend cosmonaut training in Star City, Russia. Ma and Chen chose to watch the launch, while Mohamed elected to experience some of the training cosmonauts go through. The contest was sponsored by YouTube, Lenovo, and the Alexandria, Va.-based space tourism firm Space Adventures.